It’s a new week, and I have some new nails. 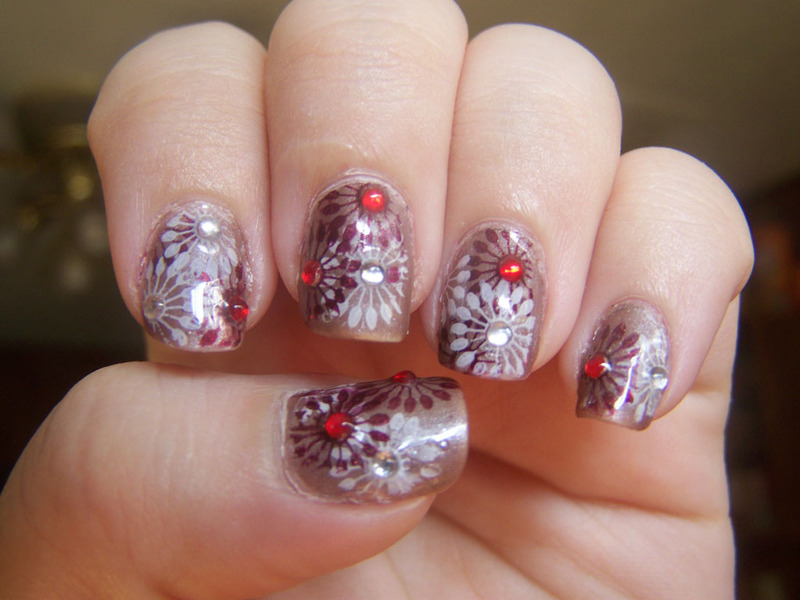 I was short on time this week and did this mani in two stages; the base color, and the stamping. That’s why my edges are a little rough-looking. I used Nails Inc.’s Sweets Way as my base, and a white creme I whipped up myself to stamp with. 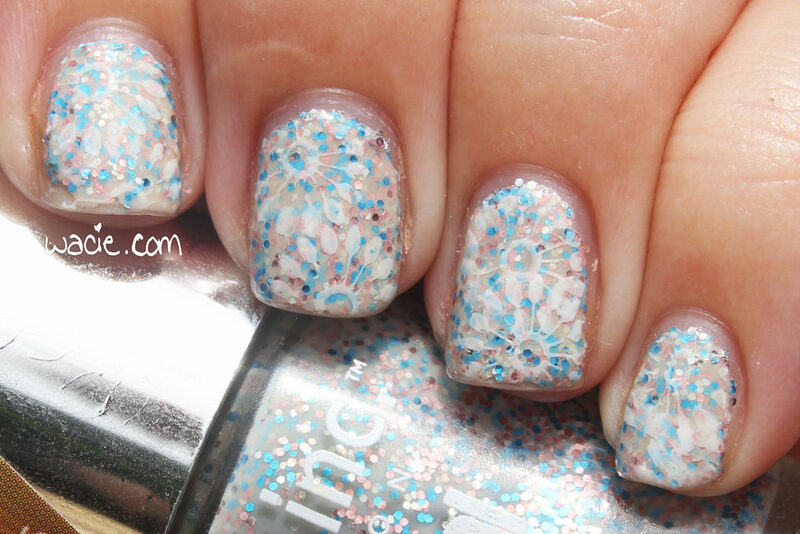 Sweets Way is a white crelly with some colorful glitters, and I knew it wouldn’t need a lot to go with it. I nearly just wore it alone, and I did for a day or so. I decided that no, I could do better, so I did some quick stamping with my white creme. My stamping isn’t perfect, it never is, but I like the look I got. It’s like lace, just a simple little sweet something. Sweets Way was discontinued by Nails Inc.; Nails Inc. can be found at Sephora. I bought a stamping kit on my latest excursion to Sally; that was like a month ago, and I’ve just gotten around to trying it out. The neutral base color is a color called Cashmere Crème. I got it in a thrift store probably a year ago. When I got it, the printing on the bottle was mostly intact; I have no idea what happened to it since then. I’m also not entirely sure what color this even is. It looks like a tan shimmer in the bottle, but on my nails, it looks more metallic, more silver. It’s confusing. It’s a good base color for this manicure, though. It was kind of tough finding the right colors for the stamped designs. I’d set aside the dark red Mercury Rising to go with the Cashmere Crème before I even knew I was going to be doing this stamping design, and at first, I didn’t think it would be opaque enough to stamp with. I’m pretty pleased with how it came out. The white is Sally Hansen’s Hard to Get, my workhorse white color. Then I got the rhinestones out. I tried doing them just on my thumb and ring finger as accents, but then the rest of the nails looked plain, so I added a few here and there, alternating the colors on each finger. Then I got tired of seeing ones that didn’t have a rhinestone and I ended up with more than I planned, and some in odd places, like on the sides or at the very tips. For a first try at stamping, I’m happy with it.